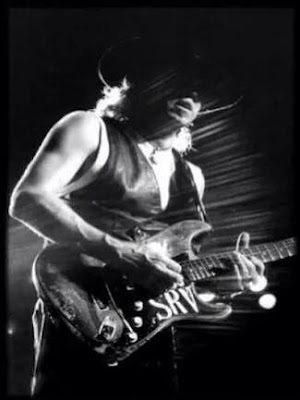 Great Guitar Solos, #9: Stevie Ray Vaughan slays "Leave My Girl Alone"
According to Caught in the Crossfire, by Joe Patoski and Bill Crawford, Stevie Ray Vaughan was up to a daily intake of seven grams of cocaine and a fifth of Crown Royal by the time he bottomed out, in 1986. After a breakdown and a visit to the ER, Vaughan got clean for the first time in over 15 years. Sobriety, in concert with a deep spiritual focus and regular AA meetings, did wonders for Vaughan mentally and physically, but he worried about his guitar playing, which had been fueled by drink and drugs for so long. Would he be able to light up the guitar without his chemical crutches? The fireworks on Vaughan's next album (In Step) and the shows in support of that release proved that his concerns were misplaced. In October of 1989, a few months after In Step came out, Stevie Ray Vaughan and Double Trouble played their home town of Austin, where Vaughan had been a struggling musician for over a decade, couch surfing and gigging for peanuts, before David Bowie plucked him from obscurity for the multi-platinum Let's Dance album. My favorite performance from the Austin City Limits show is the rendition of "Leave My Girl Alone," a tune written by Vaughan's good friend, blues titan Buddy Guy. The song is simple and heartfelt, the guitar and voice up front as the rest of the band hang back. The singing is passionate; when Vaughan says "you better leave my little girl alone," you believe him. The guitar fills are a model in economy and bite. And the solo, from 2:11-3:40, is epic: Vaughan rips into his guitar with raw blues power, for the most part bypassing the big, juicy bends and wide vibratos that were his specialty in favor of ferocious runs that stop and start on a dime. This Saturday, on what would have been Stevie's 61st birthday, blues fans and six-string aficionados alike will mourn the early passing and celebrate the lasting legacy of the last true guitar hero. It was a perfect afternoon for a photo shoot. Warm, but not oppressive. Sunny, nothing but blue sky above. The wind from the ocean in repose. Fall, 2013. Up until then, I'd usually planned shoots in advance, around weather reports, but this was a spontaneous undertaking fueled by the pristine day and the unexpected good news that I'd gotten the rest of the week off of work (on a Monday, no less). As people toiled away in home offices and restaurants and high rises, I headed out to explore my urban playground with bike and camera. I started at the peak of Noe Valley, a section of San Francisco with breathtaking vistas that I'd been to many times since I attended my first writing workshop there, in 1997. But it felt different that day. Maybe it was the weather, or the knowledge that I had several days of free time ahead of me, or perhaps it was the livewire sensation of all of the above synergized by the ginkgo biloba I swallowed before I left my apartment, but my camera eye was finding rich images in places and spaces that had felt fallow before. I swept northwest toward the magnetic pull of the mighty Pacific, from Noe Valley to the Castro District to the Haight to the inner Sunset, where I stopped. Faced with the creeping fog line, I retreated back the way I had come. would look like; at this point, the experience was nothing but a hundred-odd digital images on a SanDisk card the size of a postage stamp. Over several days I culled the best photos, cropped and re-sized them as necessary, and sifted through the grouping of images until a narrative emerged. I then spent several more days adding and subtracting words until it felt right. With the help of my friends at Lost San Francisco, the resulting photo essay,"On a Clear Day You Can See Forever," received unexpectedly heavy traffic and reader appreciation, including kind words from the main passenger of the vintage Jetstar 88 that made an appearance in the piece. From that moment on, I approached each photo shoot-into-essay less like a predetermined storyboard and more like a free-form process of discovery. Four years ago, I was pleasantly surprised to find myself sitting next to Josh Kornbluth on a flight from Chicago to San Francisco. I recognized Josh as the protagonist in the playful independent comedy “Haiku Tunnel,” parts of which had been filmed in my neighborhood. I introduced myself as an (until-then) anonymous Facebook friend and asked Josh what he was working on. He mentioned a new movie called “Love and Taxes,” which he hoped to have wrapped up by tax day, 2012. As a devotee of the creative process who devours liner notes and DVD extras, I was full of questions about the new movie—specifically Josh’s collaborative dance with his brother Jacob, the director—but let it go. Josh was polite, but I could sense that he was eager to review the movie clips in the Mac resting on his upright tray. A few weeks ago I had the pleasure of seeing the finished project. I arrived 20 minutes before show time expecting to get a good seat, only to find a line from the box office half a block long. “Love and Taxes” was being shown on Josh’s home turf—the California Theater in Berkeley, where he has lived since 1997—at the Jewish Film Festival. The screening of this shoestring-budget, indie movie was an event. The story begins in the office of Bob, a likable tax attorney who is as mild-mannered as his name suggests. 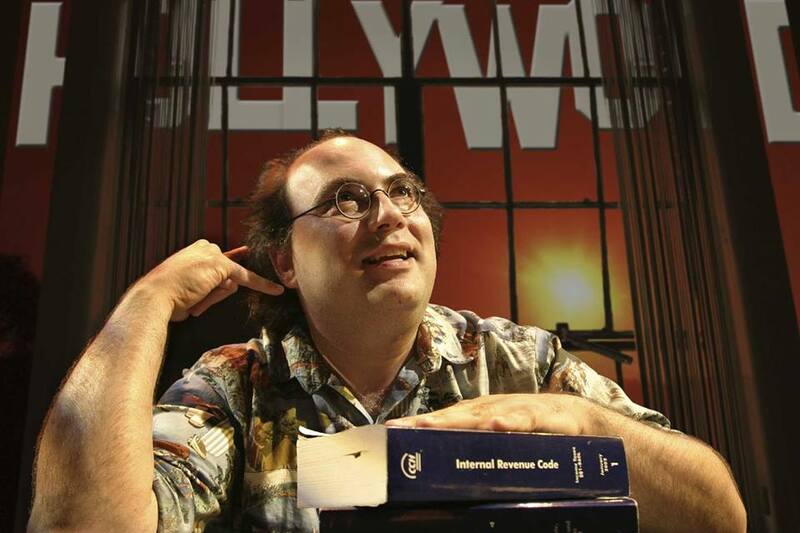 As Bob’s secretary, Josh (a thinly fictionalized version of the real Josh Kornbluth) digs through obscure legal statutes from the early 20th Century in search of tax loopholes. The droll terms used for these tactics—the reverse double-dummy maneuver, the shotgun provision—and the enthusiasm with which he carries them out make the dry field of tax law seem fun and almost cause us to overlook the societal impact of corporate tax evasion. In his free time, Josh performs a comic monologue at the Marsh, a small theater in the Mission District of San Francisco. During each performance, he riffs on the fact that he hasn’t filed his taxes in seven years, though his boss is a tax attorney. One day at work, Bob mentions that he’d seen the show and prods Josh to file. When Josh asks for help, Bob says, “I handle artificial persons. You’re a natural person,” and refers him elsewhere. to Manhattan, circa 1964. Josh’s father, a committed communist, tells his young son that he won’t file his taxes because he refuses to fund wars and handouts to corporations. Josh’s father is strong and principled, wrapping his son in the protective gauze of the “Floating Socialist Republic of Kornbluthia.” He is also manifestly outside of the system, setting a precedent that Josh follows up to the moment he steps into the tax office. From here the movie deftly pivots between fictional scenes that build the dramatic structure and humorous snippets from Josh’s (real) “Red Diaper Baby” concert monologue which fill out the context. Josh wrestles with whether or not to file and falls in love with Sara, a woman who has “complementary neuroses” and decidedly different views about the system. He receives a movie option on his stage show from an agent (played by Harry Shearer) and goes to Hollywood to write the screenplay, but feels like a fish out of water. He instead shoots the indie movie “Haiku Tunnel” with his younger brother in 18 days; it later premieres at Sundance. Josh files, but doesn’t pay his enormous tax bill. 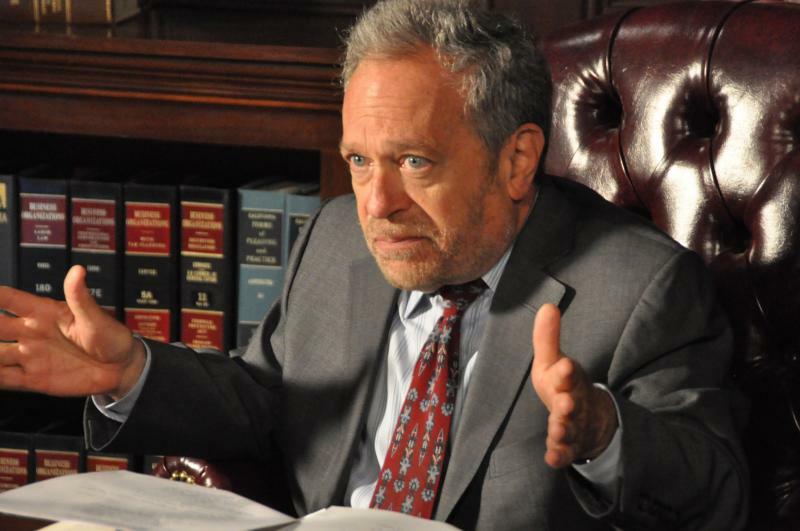 With his father’s anti-establishment words ringing in his ears, Josh visits the prominent D.C. tax lawyer Sheldon S. Cohen (played by former U.S. Labor Secretary Robert Reich), during the Bush Administration, and re-visits the question of whether or not he should pay taxes when so much of our money is being wasted on pre-emptive wars and tax cuts for millionaires. Sheldon’s answer, which is not what one would necessarily expect in such a cynical time, steers Josh in a new direction and explains the use of the word "love" in the film’s title. After the viewing, the filmmakers did a Q & A. It came out that during the seven years “Love & Taxes” was in production, the director (Josh’s brother Jacob) moved from Los Angeles to the Bay Area, married his roommate, had two children, started a non-profit, made another movie—the documentary “Inequality for All”—and slowly crafted this little movie that could by “scraping together” enough local actors to film scenes on weekends and holidays. Jacob had left L.A. to create the movies he wanted to make, not with formulaic storyboards and dollar signs in his eyes but with love, care, and humanity, and it shows. “Love & Taxes” is a DIY production that was worth the wait.